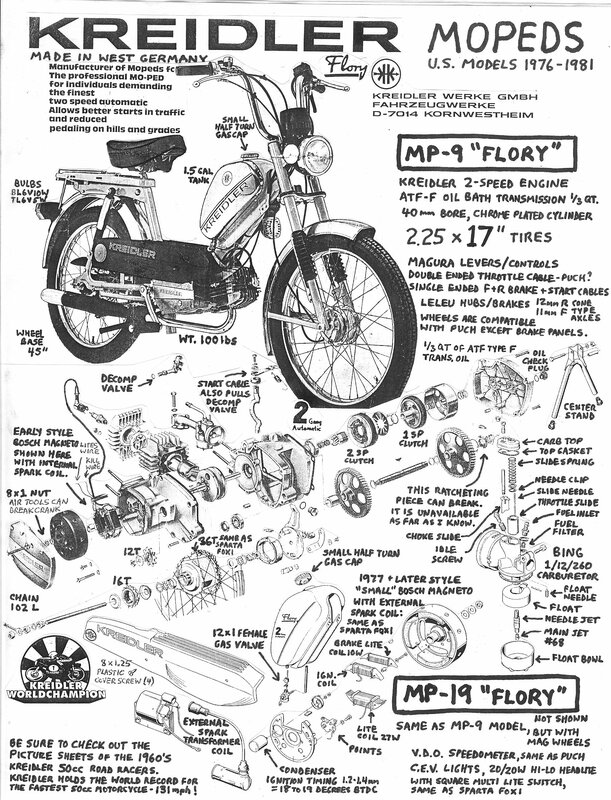 In the 1950’s and 60’s they used the name “Florett” for everything, motorcycles, mopeds, and mofas. 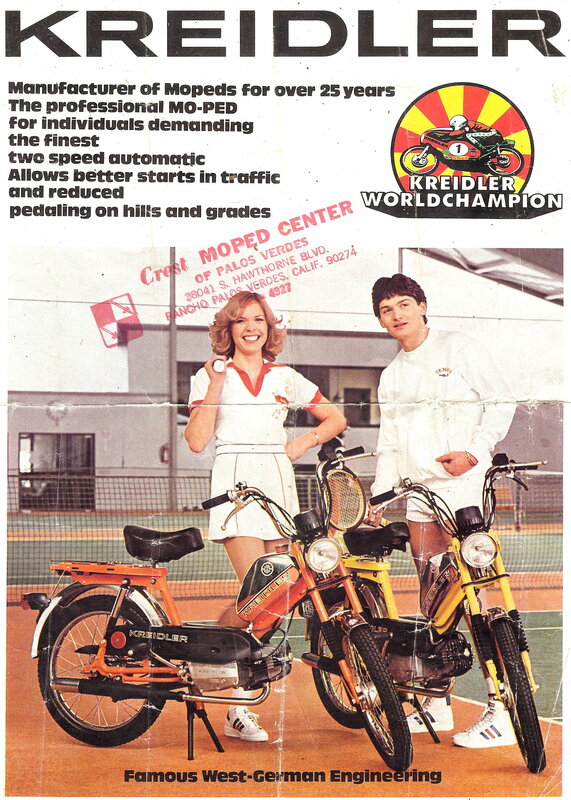 From 1969 to 1982, Kreidler mofa models had the prefix MF, while moped models had prefix MP. 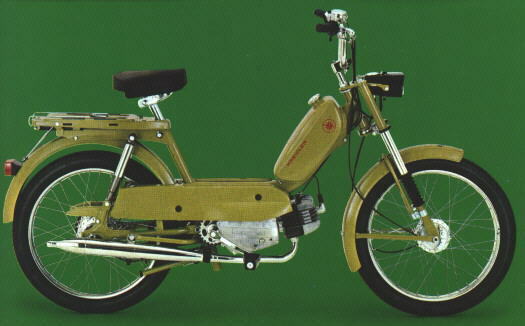 In the 1970’s the name “Florett” was for top tank motorcycles, mostly 50cc 5-speed. 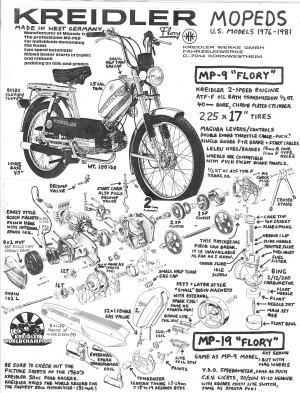 Starting in 1976 the name “Flory” was used for step-thru mopeds and mofas, both automatic 2-speed and manual grip-shift 2-speed types, and “Flott” was for top-tank mopeds. Kreidler MP 9 Flory moped was the export-to-USA version of a German-model MP 2. Other MP 2 export (non-German) versions worldwide include MP 6, MP 7, and MP 8. Some things are the same. The MP 9 air filter has “MP 8” molded into it. 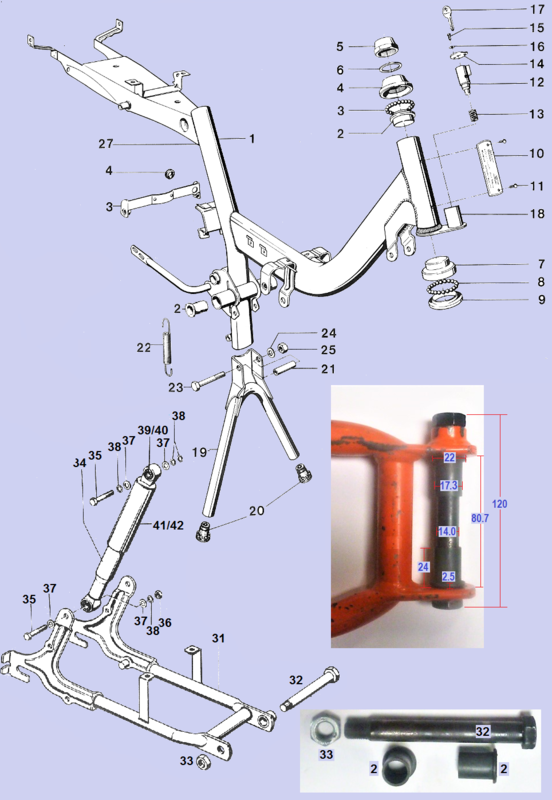 The MP 9 parts price list uses the term “MP 7” for those parts used only on the more restricted MP 9 models. 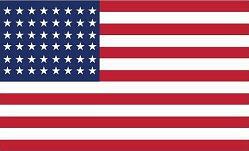 See below “USA Speed Versions”. 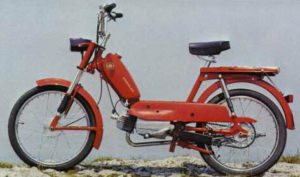 Another ZA: The Kreidler two speed automatic (Zwei gäng Automatik) is like a Puch, Garelli or Tomos two speed, with two centrifugal automatic clutches, in a transmission oil bath compartment, one that gets the bike moving forward, and another that lets it shift automatically between first and second (low and high) gear, according to the rear wheel speed. Roughly speaking, below 15mph it’s in first gear and above 15mph it’s in second gear. 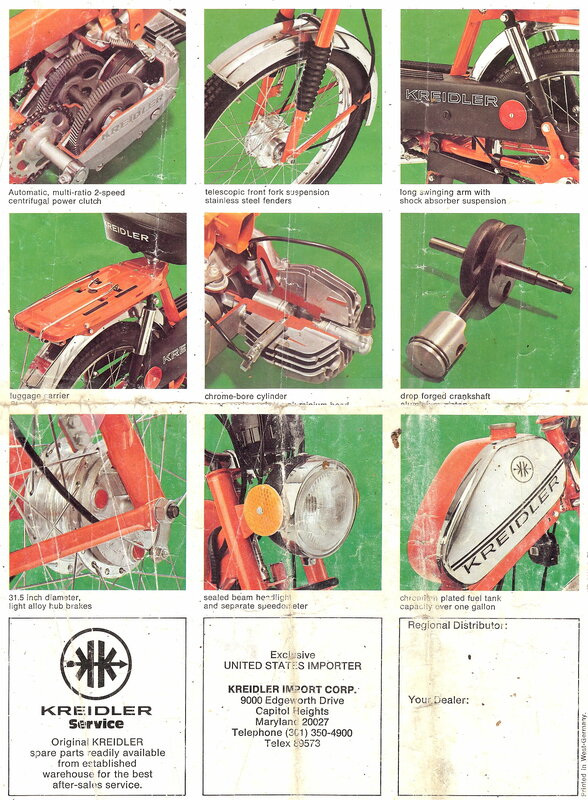 Engine Service: Here is a link to the 1976 engine “Assembly Disassembly Instructions” manual. This beautiful illustration of an early 1970’s engine is from the 1976 service manual “Assembly Disassembly Instructions”. The front of the engine is facing into the page and to the left. In the views below the front is facing out of the page and to the right. 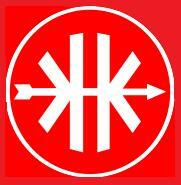 So both the front and the back side of each part are shown, here or there. Parts specific for 17 and 20 mph versions ore orange. C10 1 215.03.25 N/A intake gasket bigger I.D. 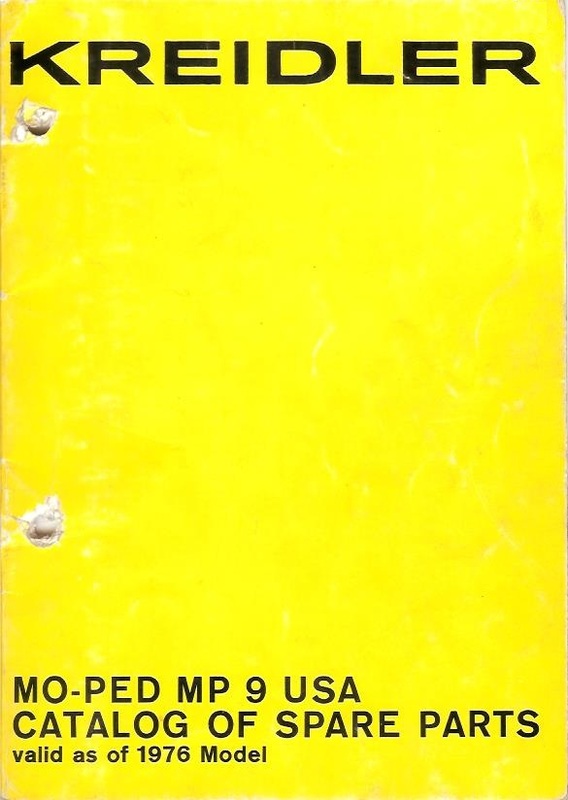 The 1977 MP 9 and MP 19 owners manual says there were four speed versions offered, 17, 20, 25, and 30 mph, for different US states. 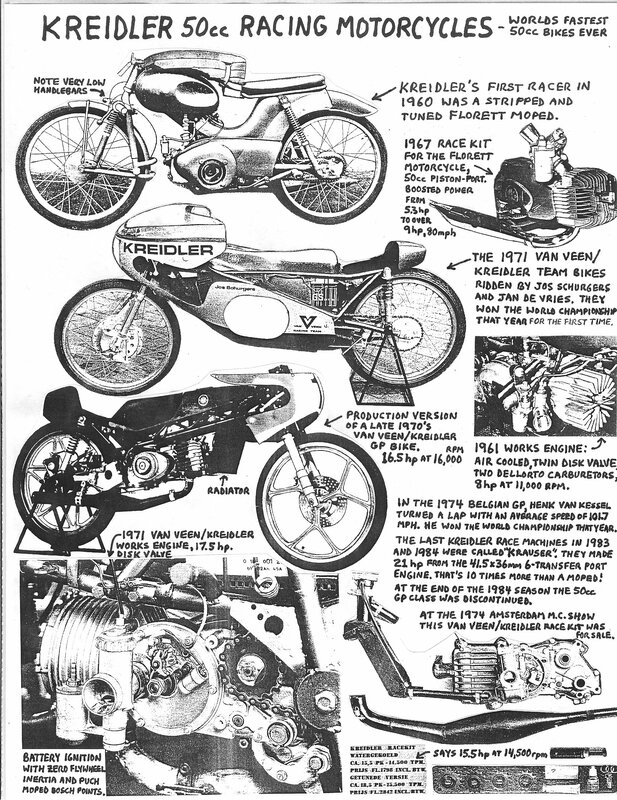 But none of Myrons Mopeds’s Kreidler brochures or manuals, parts, service or owners, say specifically what parts are on each speed version. The parts catalog is only for 30 mph. 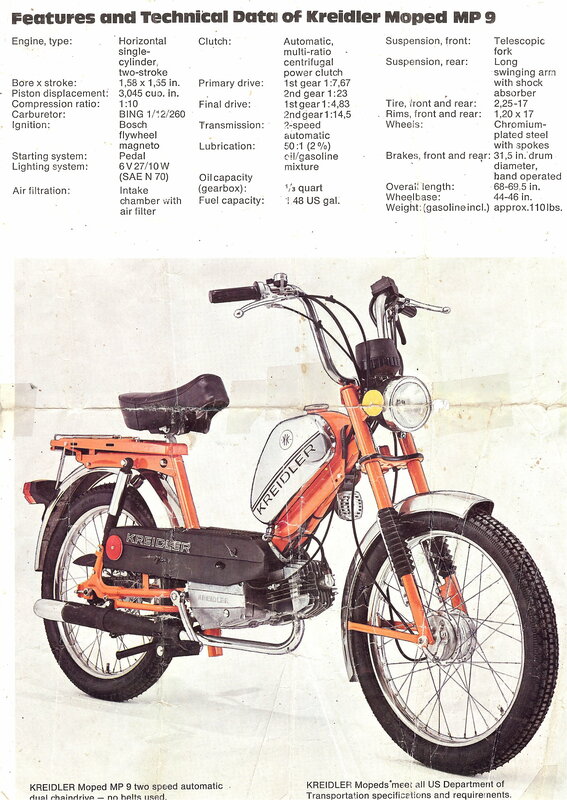 Here is what can be learned from the Kreidler of America, Inc. 1981 Parts Price List and the Kreidler Werke GMBH 1976 Catalog of Spare Parts for MP-9 USA. The carburetor size is always the same 12mm, either early metal-tip-float-needle 1/12/260, or late rubber-tip 1/12/268 which superseded it. 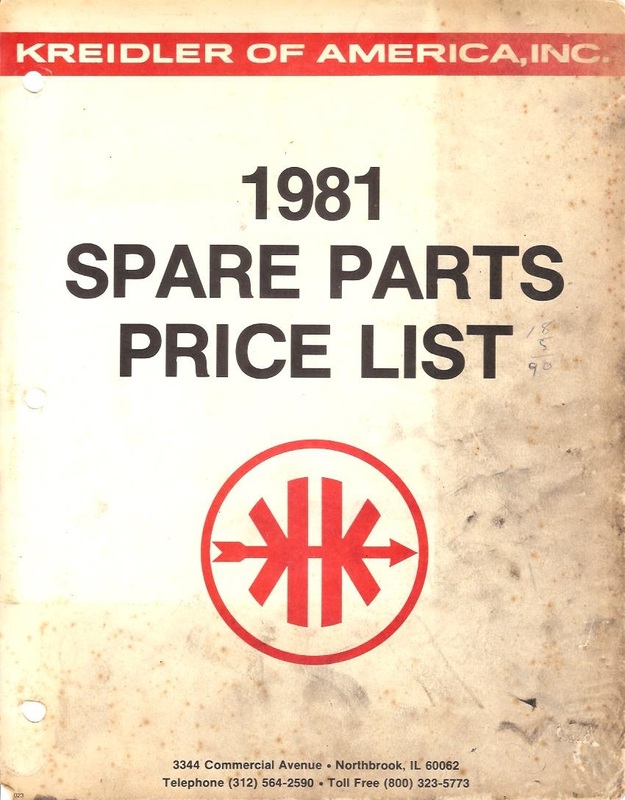 There is no other carburetor anywhere in the 1981 USA price list. 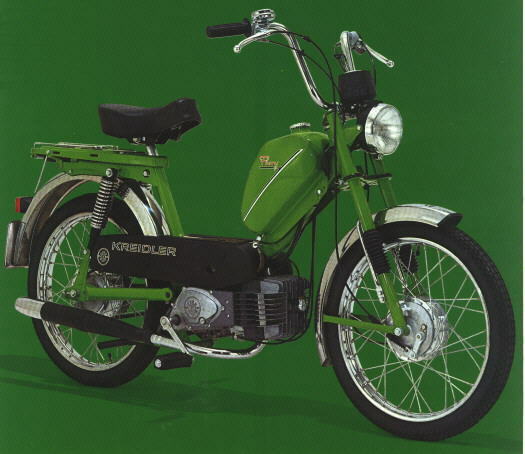 Other similar Kreidler mopeds and mofas worldwide have 10mm carburetors, such as 1/10/105 or 1/10/126. Besides there being only one carburetor, there is also only one cylinder, one piston, one head, one kind of internal gears, and one intake pipe. Exhaust The head pipe, rear cone, and baffle are all the same. Assuming that the equipment that came on the bikes was in the price list, the speed version differences can be guessed. The guesses are shaded light grey. All of the other parts on the bike are the same for all speed versions. A tube 14.2 x 17 x 76.5, plus two washers 14.2 x 2.5 would be a simpler, but maybe less precise substitute. The original material is a soft plastic. It squishes or deforms under heavy load. When installed the soft bushing shrinks from 14.2 x 17.35, to 14.0 x 17.0. A hard material like brass would not shrink. That’s why brass replacement bushings need to be slightly smaller than the originals. They have most things. They can take a month or more for handling and shipping. 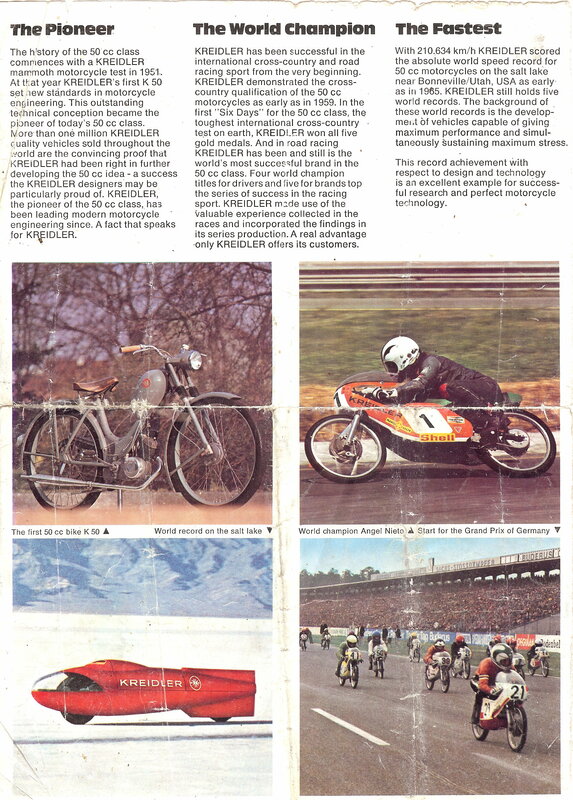 You are currently browsing the archives for the Kreidler Parts category.